The recent announcement of a nuclear deal between the governments of Iran and other major nations, including the United States, naturally draws our attention to the history of international nuclear arms control and disarmament agreements. What accounts for their advent on the world scene and what have they accomplished? Ever since 1945, when the atomic bomb was built and used by the U.S. government in a devastating attack upon Japanese cities, the world has lived on the brink of catastrophe, for nuclear weapons, if integrated into war, could cause the total destruction of civilization. To cope with this ominous situation, the Truman administration, in 1946, turned to promoting the world’s first nuclear arms control agreement through a U.S. government-crafted proposal, the Baruch Plan. Although the Baruch Plan inspired enthusiasm among nations friendly to the United States, America’s emerging rival, the Soviet Union, rejected this proposal and championed its own. In turn, the U.S. government rejected the Soviet proposal. As a result, the nuclear arms race surged forward, with the Soviet government testing its first nuclear weapons in 1949, the U.S. government testing additional nuclear weapons and expanding its nuclear weapons stockpile, and the British government scrambling to catch up. Soon all three nations were building hydrogen bombs―weapons that had a thousand times the destructive power of the atomic bombs that had annihilated Hiroshima and Nagasaki. 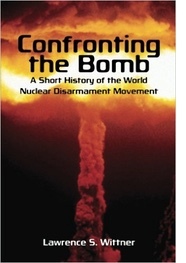 But this escalation of the nuclear arms race, combined with growing popular protest against it in the United States and around the world, led to new international efforts to forge a nuclear arms control agreement. In 1958, the Eisenhower administration joined the governments of the Soviet Union and Britain in halting nuclear weapons testing and began serious negotiations for a test ban treaty. In 1963, the Kennedy administration, along with its Soviet and British counterparts, negotiated and signed the Partial Test Ban Treaty, which banned nuclear weapons testing in the atmosphere. In subsequent years, Democratic and Republican presidents, anxious to reduce nuclear dangers and to pacify a restive public, uneasy about nuclear weapons and nuclear war, signed numerous nuclear arms control and disarmament agreements. These included: the nuclear Non-Proliferation Treaty (Lyndon Johnson); the Anti-Ballistic Missile Treaty and the SALT I Treaty (Richard Nixon); the SALT II Treaty (Jimmy Carter); the Intermediate-Range Nuclear Forces Treaty (Ronald Reagan); the START I and START II treaties (George H.W. Bush); the Comprehensive Test Ban Treaty (Bill Clinton); the Strategic Offensive Reductions Treaty (George W. Bush); and the New START Treaty (Barack Obama). These agreements helped dissuade the overwhelming majority of the world’s nations from developing nuclear weapons. Many nations had the scientific and technological capability to build them, and in the early 1960s it was assumed that they would do so. But, given the new barriers, including international treaties banning further nuclear testing and discouraging nuclear proliferation, they refrained from becoming nuclear powers. Nor was this the only consequence of the agreements. Even the small number of nuclear nations agreed not to develop or to maintain particularly destabilizing nuclear weapons and to reduce their nuclear stockpiles substantially. In fact, thanks largely to these agreements, more than two-thirds of the world’s nuclear weapons were destroyed. Also, to enforce these nuclear arms control and disarmament agreements, extensive inspection and verification mechanisms were developed. Perhaps most significant, nuclear war was avoided. Wouldn’t that nuclear catastrophe have been more likely to occur in a world bristling with nuclear weapons―a world in which a hundred or so nations, many of them quite unstable or led by fanatics, could draw upon nuclear weapons for their armed conflicts or sell them to terrorists eager to implement their fantasies of destruction? Only the NRA or a similarly weapons-mad organization would argue that we would have been safer in such an environment. To be sure, nuclear arms control and disarmament agreements have always had their critics. During the debate over the Partial Test Ban Treaty of 1963, Edward Teller―the prominent nuclear physicist who is sometimes called “the father of the H-bomb”―told U.S. senators that “if you ratify this treaty . . . you will have given away the future safety of this country.” Phyllis Schlafly, a rising star in conservative politics, warned that it would put the United States “at the mercy of the dictators.” A leading politician, Barry Goldwater, spearheaded the Republican attack upon the treaty in the Senate and during his 1964 presidential campaign. Nevertheless, there turned out to be no adverse consequences of the treaty to the United States―unless, of course, one views the rapid decline of the U.S.-Soviet nuclear confrontation as an adverse consequence. Placed in the context of over a half century of nuclear arms control and disarmament agreements, the Iran nuclear deal does not seem at all outlandish. Indeed, it seems downright practical, merely ensuring that the nuclear Non-Proliferation Treaty is implemented in that major nation. Toward this end, the agreement provides for Iran’s sharp reduction of its nuclear-related materials that, potentially, could be used to develop nuclear weapons. Moreover, this process will be accompanied by extensive monitoring and verification. It is hard to imagine what more today’s critics could want―except, perhaps, another unnecessary Middle East war.